Technical Car Experts Answers everything you need: The hydraulic clutch assembly removal on motor cycle? 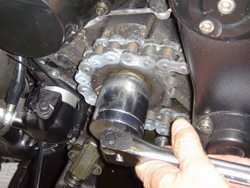 The hydraulic clutch assembly removal on motor cycle? After the bike is up on the paddock stand, and before the shifting assembly is removed, put the bike in first gear. This is necessary for removing the big front sprocket nut, and it's much easier to do it now than after the shift mechanism is removed. 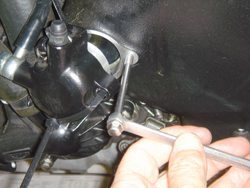 After placing the bike in first gear, remove shifter assembly. It's not necessary to remove the shift rod (yellow arrow). The Haynes manual suggests draining the oil from the bike's crankcase prior to starting this job. 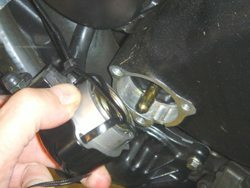 This is to prevent the oil from draining out when the sprocket cover is removed. Since we're always looking for the easy way out, we did not drain the oil from the crankcase first, so that we could see if this step could be avoided. Only about 1/3 of a quart of oil drained out after the sprocket cover was removed, and this can easily be replaced after the job is complete (saving the precious $8-$10 per quart synthetic), so our opinion is that draining the oil from the bike is not very much necessary. 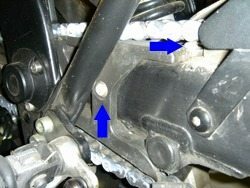 Note that this only works if the bike is upright and on the swingarm stand; as soon as the bike is leaned over towards the left (i.e., on the side stand), the oil will continue to pour out of the crankcase. But if you drain the oil and continue then its the perfect procedure. Next, we removed the hydraulic clutch assembly cover. This is easy -- the cover is only held on with 3 bolts. Note that two of the bolts are the same length, and on this bike, the bolt towards the rear is shorter. 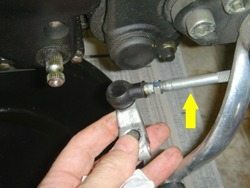 Haynes suggests using two cable ties to keep the piston inside the hydraulic clutch assembly housing, just in case someone squeezes the clutch lever while the hydraulic clutch cover is unattached. 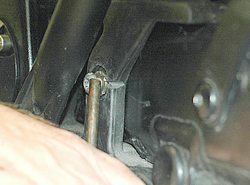 Hydraulic clutch assembly cover (above), showing the cable ties used to prevent the piston from falling out. Next, remove the sprocket cover. Whenever a thin metal cover like this with a machined edge is fastened or unfastened, it's good practice to unscrew the bolts in a cross pattern. This helps prevent the cover from warping as it comes loose. The bolts for this cover are not the same length, so make sure to keep tract of which bolt goes where, because it's not obvious once the cover is off. Pull the clutch pushrod out of its hole. 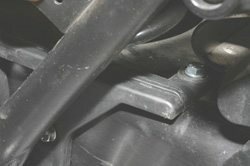 The cover has a gasket between it and the engine casing, and this gasket has enough stiction to hold the cover to the engine block, making it difficult to remove. If necessary, lightly tap the cover with a rubber mallet to loosen it up. Slide one of the hydraulic clutch assembly cover bolts through an 8mm box wrench. Then screw the bolt into the cover and pull to remove the sprocket cover. A 36mm, 1/2" drive socket is necessary to remove the front sprocket nut. But the best way to remove it is : slide one of the cover bolts through an 8mm box end wrench and screw the bolt back into one of the threaded holes for the hydraulic clutch cover. This makes a nice little improvised handle to remove the sprocket cover with an easy tug. The sprocket cover was packed with lots of road gunk, tar, bugs, dirt and all sorts of other assorted road debris stuck inside. It's amazing that a fire wasn't started in there with all the heat and friction from the chain whipping around through all this gunk! So the first thing to do once the cover is off is to clean everything out. We stuffed a paper towel down around the shifter spline to prevent any dirt from getting back into the crankcase. At this point, we were anxious to see if we could get the 36mm front sprocket nut removed, because if we couldn't, we didn't want to proceed any farther with the job, and it would have been time to take the bike over to the dealer. Blue arrows showing the location of the Torx bolts that hold the chain guide. First, bend back the tabs on the lock washer. The tabs are a safety item that prevent the nut from coming loose. The nut that holds the front sprocket is a huge 36mm. I have no idea how I ended up with a 36mm socket, but deep in the back of a drawer in my tool chest there are a few really big metric Craftsman brand (Sears) 1/2" drive sockets, and one of them just happened to be 36mm, so we were in luck. 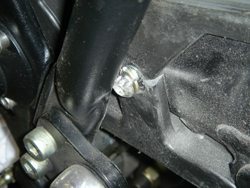 To remove the bolt without having to remove the swingarm, carefully grind a notch with a Dremel tool and cutoff wheel. then tap the bolt using a drift and hammer; grind another notch, tap it again, etc. The front sprocket nut is secured using a tremendous 132 NM of torque; I couldn't budge it with a 1/2" drive, 14" long breaker bar, and had to go down to the local hardware store to get a piece of pipe to use as a cheater to slip over the end of the breaker bar. One person sat on the bike and held the rear brake pedal down, and with some effort I managed to break the nut loose. The new chain guide replacement, using M6 stainless steel hex head cap screws to replace the original Torx screws. Labels: The hydraulic clutch assembly removal on motor cycle.